MANILA, Philippines - The official results, list of passers, top examinees and other important announcements for August 2017 Civil Service Exam - Pen and Paper Test (CSE-PPT) both for professional and subprofessional levels released by the Civil Service Commission (CSC) within forty one (41) days after the eligibility examinations. 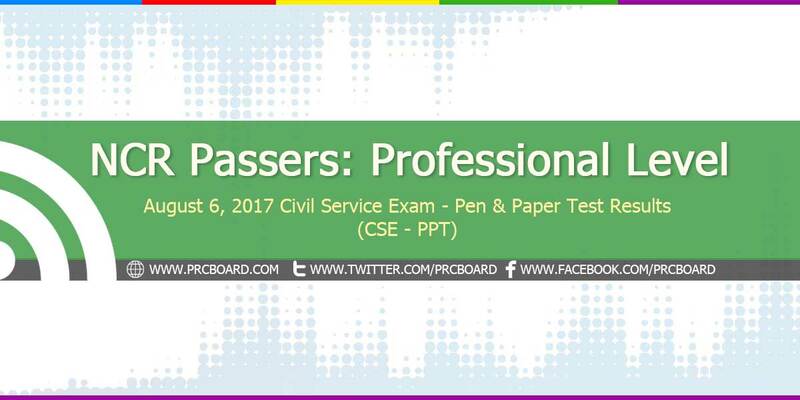 Below is the complete list of passers for August 2017 CSE-PPT Professional Level in Region 13 (National Capital Region - NCR). TOCO, JOAN ZOE M ? CSE-PPT (Professional and SubProfessional) are eligibility exams conducted by CSC twice a year to cater the growing number of individuals who wish to serve in Philippine government. The exams are administered by the Civil Service Commission on August 6, 2017 at CSC testing locations around the country specifically in NCR, CAR, CARAGA, ARMM and all Regional offices nationwide. Who had their exam in Raja Soliman High School in Binondo, specifically Room No.21? Di ba we had a problem with the distribution of our exam bcos of the assigned proctor na hindi alam yung rules ng exam? They listed our names and they didnt clarify to us if ano ang gagawin. I checked all the names and walang pumasa sa room. Where can I send my concern about this so that I can clarify whether they really did do something about it or they just set it aside? Thank you. Hi. My cousin took the exam and was in the same room as you. He didn't pass as well. He also said that the proctor did a lot of mistake during that day. What can we do about this matter? Did you get to know the name of the proctor in charge? Thanks! In our case we did not start at 8 a.m. Why? Because our room at the University of Makati was not exam ready and they had to install two flourescent tube lamps and placed a ballast in the assembly. It took the repairmen more than 30 minutes to install. It was almost 8 am when we started the preliminaries. We started the exams at 8:25 a.m. This being the case we finished answering the questions at 11:35 a.m. because in the professional level the allotted time is 3 hours and 10 minutes. Initially the proctor said that we should finish the exams in 3 hours or at 11:25 a.m. but I complained because the rule says that the exam is for 3 hours and 10 mins. complete results na po ba ito? A week after the release of results, you can check for your rating. Seryoso ka sa sinasabi mo? Kapag di nakapasa edi hindi nag aral ng mabuti noong nasa grade school to high school? Mali ata pagbigay mo ng advice. Hahaha. Hindi mo na lang sinabi na do your best makapasa man o hindi atleast he/she gave his/her best shot. review talaga kaylangan friend, atleast 2 months dapat nag rereview kana kasi yung exam last august medyo tricky yung questions and sobrang time pressure..and syempre mag pray for guidance :) God bless! may point naman sa stock knowledge..and kung totoong nag aral ka ng mabuti during grade school and high school years mo.. matatandaan mo sila lahat.. you need to know the basics of everything especially the math subject. pinalaki lang mga numbers at mas mahabng computation pero its basic.. fraction, decimal, percentage and algebra ang questions.. sa english more on grammar, sequencing events, summary same as sa filipino subject.. So kung kinareer mo ang pagkuha ng mga entrance exam sa schools nung high school at college. papasa ka ng civil service..
Oo, seryoso ako. Kahit isang oras hindi ako nagreview para dito. Magbasa ka maige sabe ko kung nag aral mabuti nung gradeschool at highschool wala ka problema. Edi kung hindi ka nag aral mabuti kailangan mo talaga mag review, d naman agad bagsak. In all examinations, preparation is the key. If some passed the exams without reviewing they are really good or just lucky. I passed this exams on my first try last August 6 because I reviewed. I tried to answer reviewers I bought from the bookstore. If you understand algebra and can answer all the math problems in the reviewer when practicing for the second time on the same reviewer then you are prepared in math. English grammar, composition and the rudiments of the language is learned in school not in the reviewer. But try to answer them anyway. If you are hitting the correct answers then you are in the right path. General information is stock knowledge. You can only know about something if it came or felt them through your senses. So reading is very important. If you are weak in vocabulary try to procure a vocabulary builder book at the bookstore and read it from cover to cover. Although this does not guarantee that the words that will come out will be the same in the exams but at least you will build your self-confidence. And of course pray for guidance. One week akong nagreview, and honestly, kahit isa sa mga nabasa ko walang lumabas. Pero kung alam mo yong coverage, especially yong word analysis (synomyns, antonyms, group, degrees), yon yong pinakamaraming lumabas last august at yon ang pinakawala akong confident sagutan. Unfamiliar words ang lumabas, malalalim. Find a lot of reviewers atleast ay background ka kung ano ang laman ng exam. Sa math naman, basic lang talaga siya, fractions, decimals, sequence, percentage. Masasagutan mo kung basic sayo ang algebra. Yong iba naman basta nabasa mo ng maayos masasagutan mo talaga. Pinaka kalaban mo sa exam ay TIME! ORAS! Bring your watch para may access ka sa time. (Ako kasi wala, late ako natapos, good thing is the proctors are not strict in schedule. They let us finish even if the time is up.) Confident akong pumasok sa room, climain ko talaga na papasa ako pero nong paglabas ko Hindi ako confident na papasa ako kasi, dahil sa nagbell na hindi ko na binasa ang mga nilampasan ko, sinagutan ko ng kahit ano. hahaha AT AYON NGA, PUMASA AKO! God will still guide and provide for us. I can send you my PDF reviewers if you want. Complete result na po ba ito?plss reply tnx..
cannot access the site of civil service 😦 Is this the final result ?? san makikita ang scores mo? Panu malalaman ung examinee no#? bago po magexam binigay na yung examinee # . Sana yung exam nagpo-focus sya sa kung anong department yung papasukan mo sa gobyerno. It's not possible, I think. CSC can't make a lot of exams. Government has a lot of departments. This is an eligibility, and you can enter any department as long as you passed this exam. It has to be general. kmplto na po ba ung ncr? sigurado po ba kayong kompleto na to? wala po kasi yung pangalan ko. Ang dali lang nung exam. Feeling ko nga lahat papasa eh. May quota ba ang CSC para sa mga nagtetake ng exam? hello po sa lahat at congrats sa mga pumasa. Sa mga hindi po pinalad mag take lang po ulit,pero paghandaan na ninyo ang exam. base sa experience ko dapat talagang paghandaan. Huwag umasa sa swerte. first time ko pong mag take ng csc exam at pingahandaan ko ito by reviewing my college math and english ang end result ay kasama ako sa mga passers. Syempre din po samahan natin ng dasal. Peace and God Bless! 1. The list is per region. If you took the exam in Bicol, don't look for your name in the NCR list. The links per region are on the top of this page. I assume you haven't checked which region you've viewed. 2. Passers are sorted first if passed or failed. Then the ratings will be published next. Hi. Regarding your statement no. 2, "Passers are sorted first if passed or failed." Is it Passers or examinees? If it is 'passers', does that mean this list is tentative? Thanks. I was writing this comment while half-asleep. Hi I reviewed night before ng exam lang Pero I passed. I think tama yung sinasabi ng iba na kailangan mo lang intindihin or aralin yung mga basic. Sobrang mapepressure ka lang dahil sa time. Advise ko lang eh. Be Confident but not too confident, Pray, Wag pansinin ang nasa paligid, Pray, Focus, and lastly PRAY. To all who failed and aspiring takers soon.. Take my advice, as a person who passed the exam in the 1st take in the Professional Level without reviewing anything at all, I just rely on my Stock Knowledge and Instinct.. One Advantage maybe for me is that I am a Law Student, But that doesn't matter, the only secret in passing the Civil Service Exam is quite simple, Analyze the Questions very well and use or maximize the time of the exam.. Do follow some takers who finish the exam in less than 3 hours.. Because those who finished it earlier has a higher tendency to fail.. Just take my advice, and you will pass it even without expecting it like I did. "PASSED IN 1st TAKE". I bet bagsak ka sa exam. Di mo kailangan maging magaling sa english para makapasa. Hindi lang english ang exam.at hindi sa kagalingan mo sa english nasusukat ang talino ng isang tao. Ako nakapasa sa first take ko and inaamin ko hindi ako perfect mag english but still I passed. Ipagdadasal nalang kita kung sino ka man na makapasa ka sa next take mo. Bless you! Kung madali lang ang exam like you described, how come many still fail? I prepared by reviewing my math and english grammar just to refresh my memory on the subjects and I passed. Guys, just like any government exam or any kind of exam for that matter, you just have to prep to increase your chances of passing. Of course, not unless you're some kind of a genius like Mr. Einstein here hahaha. Dude, make up your mind - u said follow the takers who finish the test in less than 3 hours but your next sentence contradict this statement. Are you sure you're a Law student? coz with the kind of advices u throw u sure don't sound like one... giving lame advices like taking the exam without reviewing? That's just full of BS! TO THE PEOPLE WHO ARE ABOUT TO OR PLANNING TO TAKE THIS EXAM - REVIEW AS MUCH AS YOU CAN AND BE PREPARED. NOTHING BEATS BEING PREPARED! alam ko na di ako makapasa last 20 mins nasa 120 pa lang ako, for some technical reason we started late 8:15 pero sabi ng proctor ilagay na 8:00 am mag start pa synchronize, anyways, I guess that 15 mins is very important, better luck next time, I'm already in government just needed this badly to get promoted, at sa mga passers good luck, pag nasa gobyerno na kayo mahalin nyo trabaho nyo and be good public servants! After po ba makapasa, may card na matatanggap or what na parang patunay na CSE passer ka? Mahirap po ba yung exam? anu po ba dapat na ireview? Based lang sa experience ko. I answered the exam for just 2 hrs and 15 mins and Im thankful that I passed the CSE. Di mo kailangang kabahan na di ka papasa porke nagpasa ka ng maaga as long as alam mo sa sarili mong prepared ka. Preparation, prayer, and relo ang kailangan pag asa mo. Wag kang magpaka kampante lalo alam mong di mo naaalala ang High School learnings mo. Mag practice ka mag sagot ng 1 min per question kasi yang ang mangyayari during the exam. Always pray before, during, and after the exam. Relo ang nagsalba tlga sakin XD Advantage to lalot alam mo ung oras during exam dahil most of the classrooms walang wall clock, magugulat ka nalang konti nalang oras na natitira.Basta practice lang sa mga online reviewers kahit 1 week before the exam. Masterin nyo ung 1 min per question. ganyan na ganyan din ung ginawa ko..at sa awa ng Diyos first take lng din pasado. Paano po ang gagawin kapag di po ako maka access sa OCSERGS to confirm ? Ako din di ko din ma-access. Baka nga sa Oct pa talaga. Pero sana this week pwede na. Awesooooome. Ayoko sana i-check kase nagexpect na ko na bagsak. God really works in shocking ways. Laging not found pa po sa ocsergs, bakit po ganun? Sino ang mga kasama kong nagexam sa Pura V. Kalaw room no 30? May nakapasa ba? Di kase ako nakapasa eh. Hihi. Pero yung mga naassign na proctor sa amin, hindi alam ang ginagawa. Itinuro ba naman samin na ang ilalagay namin sa examinee no. Ay yung sa sheet no.. diba sila naorient kaya? Thanks God I passed The exam for the very first time. I was a fresh graduate just last April 2017, so i guess habang maaga pa, just take the exam kasi fresh pa satin yung mga basic math skills and some consti knowlegde and english narin, with matching prayers na rin. Thank you Po pla kay Holy Face of Jesus dito sa Nampicuan, Nueva Ecija. Siya ang dahilan ng tagumpay ko. And another tip po, Practice kayo sa bahay nio mag exam kayo sa mga reviewer niyo with time limit to enhance your agility sa pagsagot ng tama sa mga questions ,lalo sa math. Jeongmal Kamsahamnida. I have passed the April 2016 Civil Service Exam Professional Level and It was my first take.. Just analyze the questions and the answer choices. Sometimes you think it was easy but there are tricky questions that can be solved logically not by instinct..
wag masyado seryoso 2 days before exam nagrelax ako nanuod ng tv, nagbukas ng reviewer dun sa part ng constitution and civil rights nagsagot ng mga 10 questions tinamad ako kaya nag dota muna ako inalis ko sa isip ko ung exam, mindset ko kung failed try next time luckily nung exam muntik pa ko ma late, last to pass my test paper around 11:30 kasi and deadline para pwede ka na umuwi kaya inabot na ako nung calltime nila na hanggang 12:30 ata un ayon pagtapos umuwi ako pagod pero ok naman kasi para sakin 70% na sure pasado ako. after 41 days I check ung passers nalagpasan ko pa name ko passed in 1 take ladyluck was on my side that day.